It was a murderous attack. It could have been last day of my life. My date of death could have been 23 March 2016. My entire body shivers when I try to collect that incident. When people are not safe in prison, how one can expect safety of common man outside the prison? The events that took place are as follows and it is a nightmare that I will not be able to forget throughout my life. On 20.03.2016 at about 9.30 pm, I got a call on my mobile from Contractor Santosh Gaonkar, r/o Kalem informing me that he is going to start mining transportation from the next day, that is from 21.03.2016. I replied to him that there were numerous issues to be resolved with the villagers before transportation of ore could be considered, since these issues were extremely relevant and had to be resolved before transportation could be started. 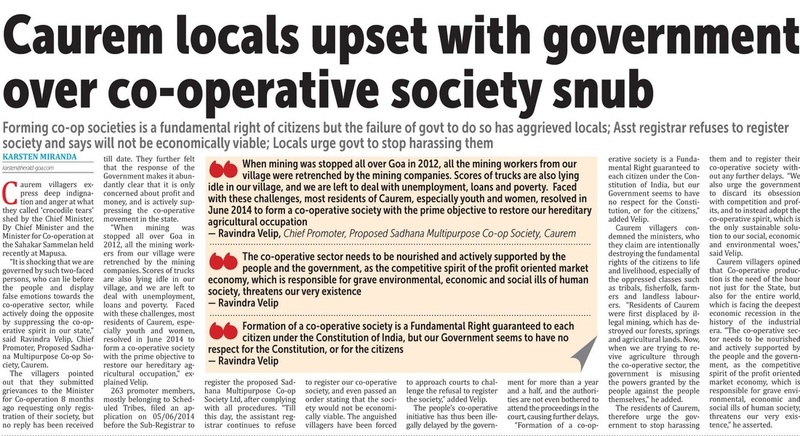 In spite of knowing that the villagers had issues with the transportation of ore and were willing to discuss and resolve the same, the mining companies decided to break all traditions and transport as much of the extracted ore as possible from the leases within the Village Panchayat Area of Caurem-Pirla, while the villagers were away. We (in the name of Shri Navnath Velip, r/o Caurem) immediately wrote to the Dy Collector & SDO, Quepem and Police Inspector, Quepem stating that as Shigmo was being celebrated, no mining transportation may take place in Caurem, during this period. Despite the letters written to the authorities, the mine owners descended upon Caurem village on Monday, 21st March 2013 and commenced unregulated and large scale transportation of extracted ore from the Fomento’s mine, TC 6/61. When we went up to the miners to ask queries, 8 of us were arrested and later released on bail. We were promised by the Police Inspector, Quepem that no transportation would take place for the rest of the Shigmo festival, and we went home satisfied. The next day on the 22nd of March, 2016, contrary to the promise of the Police Inspector, Quepem, large scale transportation of ore was started in Caurem village from Fomento Mines under police protection. Four other youth and I, who are all actively working for tribal rights, social justice and peace in Caurem village, went up to the police to ask questions regarding the legality of the ore transportation. We were arrested immediately and detained by the police. At this stage, I called up the Directorate of Tribal Welfare, Shri Anant Shirwaikar, who said that he could not do anything as it was a matter of transportation of e-auctioned ore. We were later taken into judicial custody and were transferred to Sada jail the same evening. On the morning of 23.03.2016, when I was going to the toilet inside the jail during the period when cells are open, I was suddenly attacked from behind by at least four persons, who caught me from behind, blindfolded and gagged me with cloth, and then went on to beat me fiercely. I was lifted and thrown down from a height, resulting in multiple fractures to my forearm and severe pain in my neck. When I was lying down, I was mercilessly beaten with boots and fists. I managed to release the gag on my mouth and started screaming, at which the beating stopped immediately and the attackers fled. Within moments, the other prisoners from my cell, including the other four youth from Caurem, rushed to my side and took me into the cell. When I left the cell, I was the only one outside and all other inmates of my cell were inside the cell. 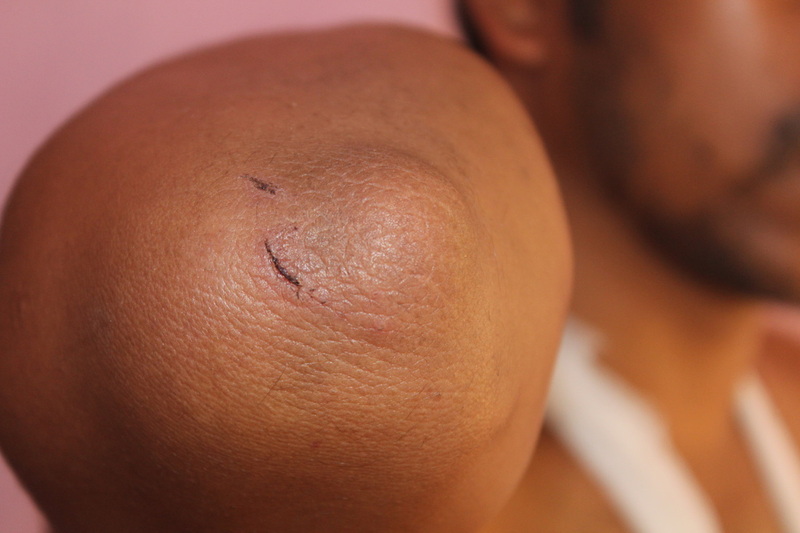 It is clear that the persons who attacked me were others. In addition, I was attacked by persons wearing boots and no prisoner was wearing boots. I was totally scared and traumatized by the incident. From threats received during the assault that my co-prisoners and family would not be spared, I felt that the warden/ jailors themselves were involved in the assault. Fearing for the lives of my co-prisoners, and suspecting involvement of the jailors and warden, I did not reveal the assault to the authorities during my imprisonment despite severe pain and trauma. 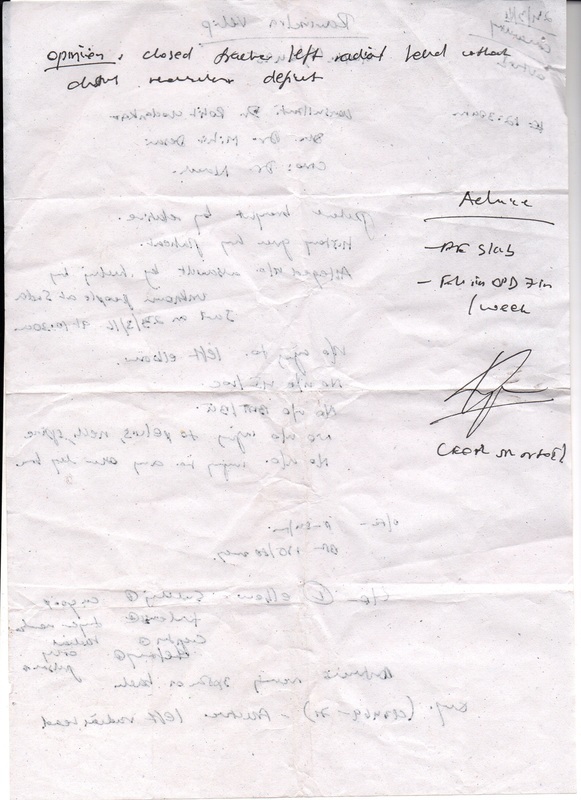 Immediately after signing the bail paper, I told the jailer that my hand was broken and that I needed medical treatment. The jailer looked at me fiercely, giving me the impression that I would be further beaten if I pursued with my request. Totally scared, I did not insist and though it best for my security to get out from the place first. I informed my advocate of the incident only after being released on bail while on the way home in my advocate’s car. My advocate immediately took me in his car to the Goa Medical College for treatment (as I was in unbearable pain). The medical authorities enquired about the injuries and I informed them the facts in brief. 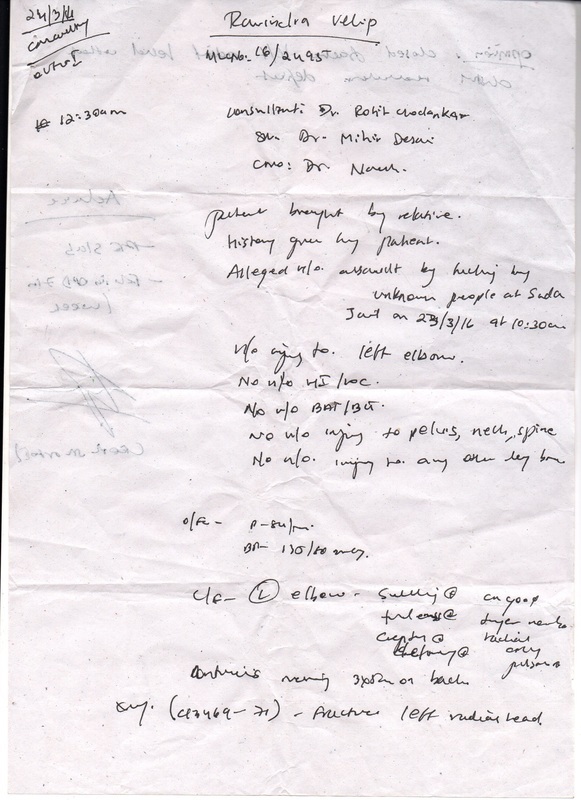 Medico-Legal Case No 16/2495 was registered by the hospital staff, copy being attached herewith. On examination and after X-ray, multiple fractures were observed by the doctor on duty. I was taken home to Caurem by the advocate as I refused to be admitted to any hospital due to fear of being further assaulted if admitted to a hospital. From yesterday I am in fear and scared to get admitted in any of the hospital. Since last evening I am experiencing extreme pain in my fractured hand and I have been consulting to the doctors since last evening. I have freshly done X-ray and CT scanning of the fractured hand. 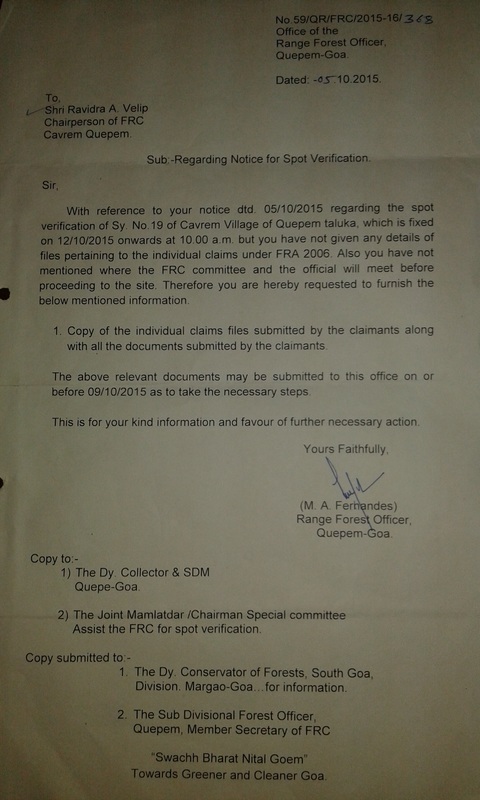 Today I have filed criminal complaint at Marmugao police station. Thorough inquiry is required in this matter as it was a pre planned murderous attack. I am alive only because of my co-prisoners and all the other prisoners of the cell where I was locked in. Many thanks to the prisoners of Cell no 10 for saving my life. ST funds remain unutilized. What could be the reason? The daily newspapers on 24th December 2015 carried the news that the Departments lack plan to spend ST fund. The major 15 departments of the State are lagging behind in spending the funds reserved for the betterment, upliftment and welfare of the Scheduled Tribe people and have spent only the negligible amount out of the total provision of Rs. 448.93 Crores made under Tribal-Sub-Plan in the annual Budget 2015-16. After reading this news, I was shocked and stunned. We all know that the communities of Scheduled Tribe are mostly nestled in the lap of the forest to whom the attention is required as far as their Education, Development, Health and Social involvement is concerned. Every year the State Govt makes the provision of funds in the annual budget but the concerned department’s fails to achieve the objective to work for the welfare of Tribals. The Directorate of Tribal Welfare which is also the nodal department to monitor the implementation of Tribal Sub Plan has hardly spent 9% of the total fund which was allocated. Why is it so? Where is the Problem? The Tribal Welfare Department have framed number of schemes but the Department claims that no approach is being made by ST peoples to take the benefits. But if we look at the manner in which any scheme is framed, the concerned Scheduled Tribe peoples were never consulted about their prime requirements. The bureaucratic system never allowed the participation of stakeholders while framing any scheme for their welfare. Let’s take an example of the Scheme called ‘Adivasi Vikas Yojana’ which was framed by the Tribal welfare department somewhere in the mid of the financial year 2013 – 14. After framing this scheme, all the files pending before the Directiare of Panchayat for approval under Tribal Sub Plan, was then transferred to the Directorate of Tribal welfare for consideration under this scheme. All these files were transferred as per the directions given by the concerned minister of Tribal Welfare (The covering letter on the files states so). But shockingly many files are still pending since there is no proper framework for implementation if this scheme and the department have made total mess because of which many panchayat’s are lagging behind with their proposed development works. The same is the situation with the other departments also. There is no co-ordination of the Departments with the concerned panchayat’s falling under the scheduled tribe areas and with the Scheduled Tribe people. This is how the Scheduled Tribe people are grossly ignored, suppressed and discriminated all over the state, by not allowing the funds to be utilised. There is no master plan is prepared till date. Every politician talks about the schemes and their infrastructure development but what about their human development and their rights? It is miserable to see that still the forest dwelling scheduled tribes seats on the roadside to sell their Minor Forest produce in the hot sun throughout the day. Aren’t they require respect for the occupation which they are engaged in? Another is the case regarding implementation of ‘The Scheduled Tribes and Other Traditional Forest Dwellers (Recognition of Forest rights)Act, 2006’ (in short Forest Rights Act, 2006). The Forest Rights Act, 2006 states that the forest rights on ancestral lands and their habitat were not adequately recognised in the consolidation of State forests during the colonial period as well as in independent India resulting in historical injustice to the forest dwelling Scheduled Tribes and Other Traditional Forest Dwellers and therefore this is the Act to provide framework to recognise these rights. The act is supposed to recognise the community rights and community forest resource land (Section 3 (1) (b) to (m)) of the forest dwelling communities which is the whole objective behind the enactment of this Act. 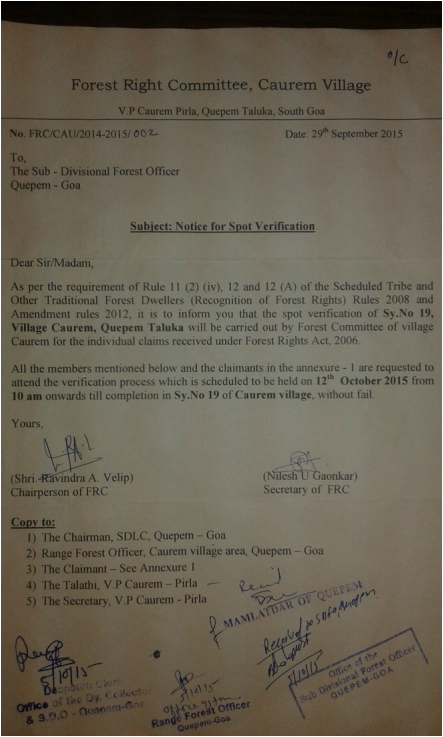 But the nodal agency, which is again Tribal Welfare Department have intentionally hided the provisions of community rights during awareness workshops because of which the Forest Dwelling people are limited up to by filing Individual claims (encroachment on forest land) which is again a historical injustice. The history often puts light on how the lands were grabbed from the Scheduled Tribe or Adivasi communities. Therefore in the name of implementation of this Act, there is a conspiracy to displace the Scheduled Tribes and grab the Community forest lands. But in this regard, Caurem village is vigilant. 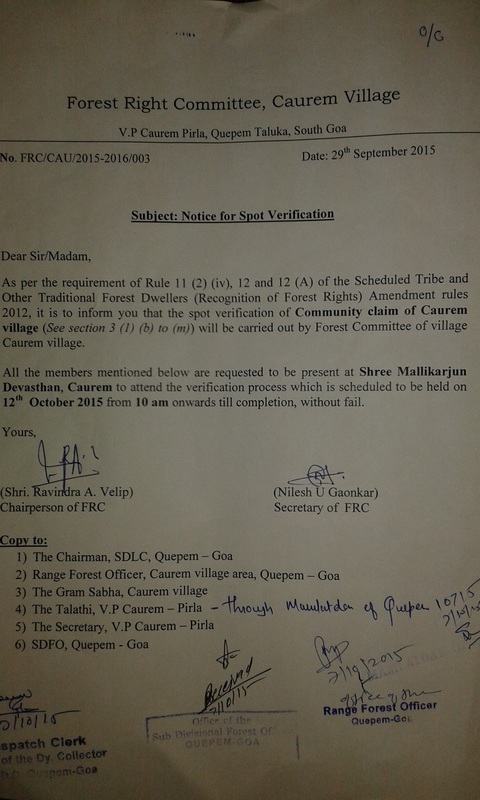 The villagers have declared their community forest rights on community forest resource land of which the verification is carried out by Forest Department. Simultaneously other villages like Cazur and Mangal are in process of the same following the process adopted by the Caurem village. If we look at one more incident that happened in Keri village of Quepem Taluka; it throws light on how the Scheduled tribe people are being threatened and suppressed to witness the atrocities. 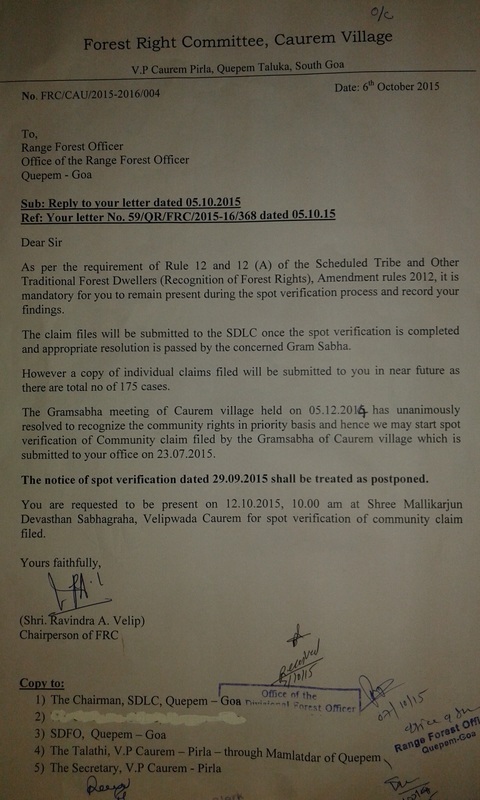 In Keri village, some Non ST people fraudulently managed to transfer the ancestral land of ST peoples in their own name. When ST peoples from Keri village came to know about this fact, they united and decided to inform about this to the concern departments. They went to lodge a complaint against the crooks in the Quepem Police Station. But the PI was hand in glows with the offenders. He ordered to put the 22 ST peoples behind the bars. They were then released on bail after 4 days of their arrest and thereafter they submitted their complaint to the State and National ST Commission. But there is no good response so far. And regarding their land, the matter is in the civil court; and for claiming their land, they have to pay heavy fees to the advocates for few more or many years. The State commission of SC and ST knows about this fact but are pretending to be in dark. So, what could be the way out for all this mess? If just glanced over the communities of Scheduled Tribe, one can easily note that there is no participation of youths and women in decision making. Of Course there are educated people in the community; even there are Doctor’s, Engineer’s, teacher’s politicians, social workers and the students who have even cleared NET exam. But what is wrong? It’s all because some so called leaders from the community itself do not allow young generation to come forward and in addition today’s bureaucratic system suppress their involvement. A maximum ground level participation of youths, women along with their elders who are indeed the store house of indigenous knowledge to express their views in decision making can be a fantastic and fabulous idea. The Official gazette Series I No. 44 published on 29 January 2015, have notified the percentage of ST population living in each Panchayat area. Therefore a master plan for the overall development of ST population in each panchayat area can be prepared with the active involvement of ST people which may be then submitted to the concerned authorities for its execution.